We paid the lawyers, so you don't have to! The Canadian Personal Will Kit™ includes everything you need to create a completely legal Last Will and Testament. The kit complies with Provincial Laws and was created in collaboration with lawyers in Canada. We support all Provinces and Territories in Canada, except Quebec. If you are in Quebec, you can download a Quebec Will Kit from QuebecWillKit.ca. What's in the Canadian Personal Will Kit™? A Complete Step-by-Step Guide to creating your own legal Will. Written in plain English, this booklet will answer your questions and guide you through the process of writing your own Last Will and Testament. The guide covers key topics including the structure of the Will, tips on choosing your Executor, naming Guardians for your children, a description of the probate process and an overview of how to sign the Will to make it a legal document. 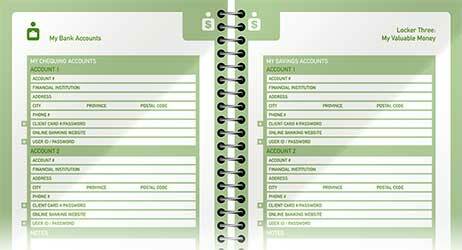 Personal Asset Inventory Forms that will help your Executor gather and distribute your estate. These forms will help you to document your personal details, list family members to be notified, and describe your assets and liabilities. These forms should not be included in your final Will, but should be stored with the Will, and can be updated on a regular basis. Funeral Wishes Form which you should use to document your wishes regarding your funeral. This will provide much-needed guidance to your family and friends, who will be left to organize your legal and financial details as well as your funeral arrangements at a time when they will be most vulnerable and least able to cope with some difficult choices. A Sample Completed Will that shows you how the final document will look. This sample can serve as a model for how you can fill in your own estate planning information. TWO Last Will and Testament Forms that you will use to write your own Will. We include two forms so that you can choose to save one for a future update without needing to order an additional kit, or you can pass one form to a spouse, partner, loved one or friend. Together with the kit, this blank form represents an additional $34.95 CAD value. The complete kit is packaged in an attractive folder that allows you to store all of your estate planning information in one place. 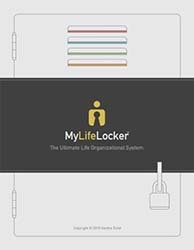 What is the MyLifeLocker™ Organizational System? An organizational workbook. We've done all the work for you. We've gathered all the details of your life and laid them out into 4 sections/lockers. Over 150 pages, covering everything from your family, to your important contacts, to all of your assets. You simply record the information and voila, all your life's details are in one spot for you today, or someone in your family later. Designed for everyone. It's not just a book, and it's not only for the elderly or seriously ill. It's an amazing, practical tool for anyone who wants to organize and store all their important "facts of life" somewhere safe and easily accessible. Critical for your Executor. With MyLifeLocker™, your family and the Executor of your Will won't be left scrambling to find your Social Insurance Number, the name of your insurance company, the second cousin who's supposed to get your antique crystal vase . . . you get the picture. They can grieve in peace and focus on saying goodbye, comforted by the knowledge that the essential but tedious details are taken care of. An invaluable tool. Anyone who has to organize, manage and safeguard personal information will find MyLifeLocker™ invaluable. For more information, go to MyLifeLocker.com. What is the Flame Fortress™ Fire Resistant Bag? Protect your Will. 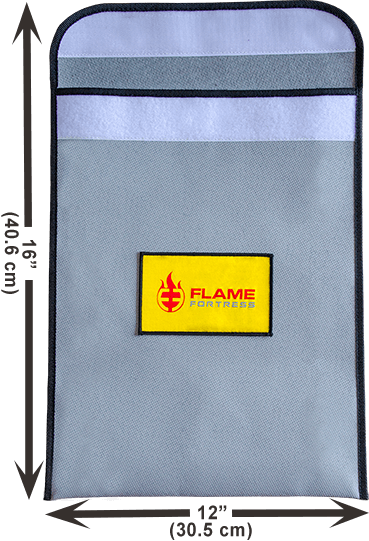 The Flame Fortress™ fire-resistant document bag is made from the highest quality heavy duty materials, including tightly woven fire-resistant fiberglass, with double-sewn edges and treated fabric. It a huge 12 inches x 16 inches (30.5 cm x 40.6 cm) in size. Big enough to protect your important legal-sized documents such as your Last Will and Testament and your MyLifeLocker Organizational System. You could even use it to protect your property deeds, passports, birth certificates, cash, photos and other valuables. Everyone has important documents that need to be kept safe. This fire-resistant document bag is just the place to keep your documents safe from fire. 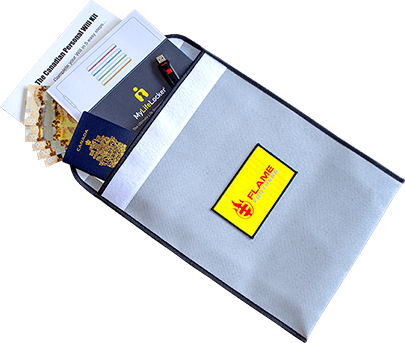 This fibreglass bag protects your vital documents up to 535 degrees Celsius (1000 degrees Fahrenheit). Water proof surface material also protects against water damage. No glass fibres. Competitive bags are made from raw white fiberglass, which can cause severe skin irritation. The Flame Fortress™ bag is coated to reduce irritation. No gloves needed. Easy to use. Simply insert your valuables into the bag, and secure the convenient extra-wide Velcro® closure. The bag lies flat, so it's easy to store anywhere in your home or office. Flexible enough to be folded into tight spaces. For greatest protection, store in a lower level of your home or office. 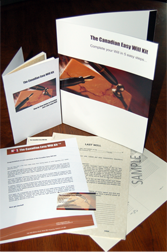 Special price available only to Canadian Personal Will Kit customers. We are able to sell this high quality fire-resistant document bag at a discounted price of only $29.99 CAD $24.95 CAD. For more information about the Flame Fortress™ fire-resistant document bag, go to FlameFortress.com. Copyright © 2000-2019 PartingWishes Inc. All Rights Reserved.